The annual Prineville Truck and Tractor Pull was held last Friday and Saturday at the Crook County Fairgrounds. Mechanical failures and other issues took some of the top pullers out of Saturday's competition, but there was still plenty of competition. "It went well," Crook County Fairgrounds Manager Casey Daly said following the event. "Our marquee tractor blew up an engine on Friday night, and they were picking parts up off the track, and we had a lot more trucks than tractors." Daly added that is to be expected as tractors are much more expensive to build than trucks, limiting the amount of competitors. The marquee attraction was Larry Pfennig, driving a red tractor called Alimony. After making full pulls each of the last two years, Pfennig still put on a show Friday night with a pull of 375.83 feet before the blown engine forced him to stop. Unable to repair the engine, Pfennig, of Salem, was unable to hook up for a drive on Saturday. Still, spectators at the fairgrounds were treated to a show with a multitude of different trucks pulling. Haley Wills of Lyons won the two-wheel drive stock truck division in a 1971 Chevy, with a pull of 285.401 feet on Friday then a pull of 330.82 Saturday. Les Lomax was second in the division with a pull of 287.76 feet Saturday afternoon in his 1967 Ford. Dave Anderson won the stock truck division as the Forest Grove driver had a pull of 351.91 feet with his 1995 Chevrolet. Yamhill's Joey Tretter was second with a pull of 306.43 in his 1972 GMC. Rick Pini of Eagle Point took first in the modified diesel category with a pull of 294.48 feet. Ryan Pini of Central Point actually had a longer pull on Friday with a distance of 344.60, but was unable to compete on Saturday. The modified two-wheel drive was split by Justin Schmidt of Forest Grove and Kris Claeys of Hillsboro. Claeys had a pull of 389.88 on Friday, while Schmidt mustered a distance of 344.36. However, Schmidt got the better of Claeys on Saturday with a pull of 296.05, while Claeys managed a pull of just 95.62 feet. The largest category of competitors was in the country modified division, which saw 12 competitors each day. Corey Coad of McMinnville took first on Friday with a pull of 386.38, while David Decker of Murphy was second with a pull of 356.34 feet. Decker came back to take first on Saturday with a pull of 301.40, while Coad was second with a pull of 261.89. The pro-mod 4x4 was won by Ralph Tramp of North Plains, in a 1950 GMC, who had a pull of 398.86 on Friday. Tramp came back with a pull of 349.52 Saturday. Mike Roberts of Red Bluff, California, in a 1974 Ford, was second both days with pulls of 383.03 and 302.72. 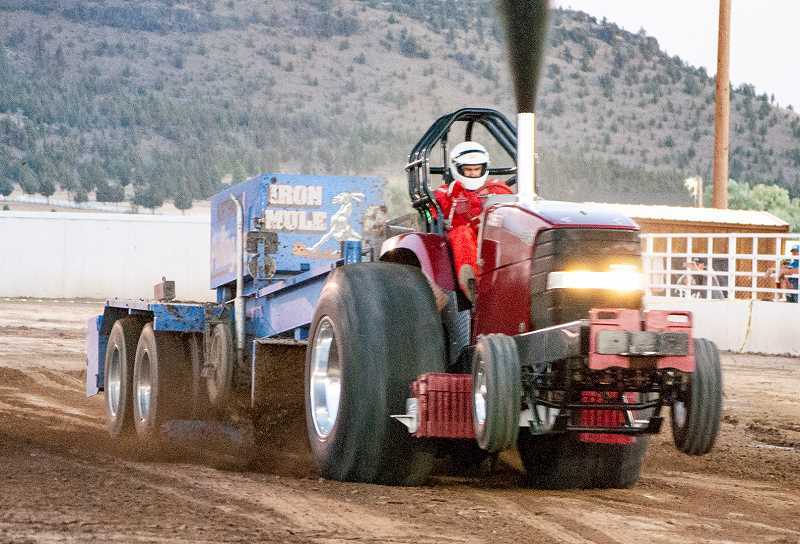 Chris Taber of Shoshone, Idaho, won both days of the smoker tractor with runs of 416.58 feet on Friday and 461.37 Saturday. Fred Hink of Prineville won the lawn mower pull with a pull of 220 feet in his 26 horsepower Craftsman. Other winners were Dillon Newbowls, gas and light truck; Trevor Ells, heavy truck; and Jared Kesinger, heavy diesel. Andrew Forster won the extra heavy diesel category, while Newbowls won again on Saturday in the light diesel category. The closest competition of the event was in the local tractor pull, with Rob Katzenbeger in a 1958 John Deere winning with a pull of 386.84. Steve Keffer in a Massey Ferguson was second with a pull of 370.90, while Doug Smith and Rich Brown tied for third with pulls of 370.45 in a 1957 John Deere and a 1992 Massey Ferguson, respectively. "The drivers were all pleased with the track," Daly said. "But we did get one complaint on Facebook that the track was too wet. The water was for dust abatement, and we didn't get any complaints from the drivers about the track, that was just a comment from the public." Daly added that the event ran smoothly, although he was disappointed with the attendance. He attributed the lower than hoped for attendance to hot weather, especially on Saturday.